My kids show musical interest. Musical interest, not concertos by three, not cuddled in their rooms strumming strings every spare minute, but interest enough to practice without prompting, planning plays with musical numbers and perusing YouTube for the latest Taylor Swift hits. They enjoy music. They started with violin. Why violin? Because I said, what do you want to do–piano or violin? And the eldest said, violin. Can’t say why she chose that, but I’ll assume it was the same romantic notion of velvety violin pieces performed for adoring family and friends that I had. Turns out, playing violin well, for most people, takes many, many years, and a passion for the instrument that elevates the sound to something like that of a plane overhead bringing your husband home, of a baby as she first enters the world, of your home when everyone has gone for the afternoon but you. I had read a book by Suzuki and felt pretty certain that this musical philosophy was a healthy way to initiate musical studies. Suzuki emphasized playing from an early age, learning music by ear, and playing in groups. I found an instructor that was so skilled, routinely part of musical performances (actually the concertmaster at the local symphony), that I insisted they all take a couple years with him, until one fateful day, I heard each one of them say, “Mom, do I have to do this anymore?” And these pleas to stop the musical bus weren’t sourcing from a slothful sullenness…they cared to pick up their violin as much as I enjoyed threading the sewing machine for the girls’ summer wardrobe….please, no, let me just go to the store! 1. Make them do it. It’s good for them. They will probably develop a love for it. I heard this from still-playing adults, who have come to love their instrument and others who have even gone on to teach their instrument. I have most often heard it from devout parents who insist that doing something the kids don’t really care to do will develop fortitude, consistency and skill by the mere act of putting in daily focussed efforts. 2. Let them choose their own path. This fits well with my notion of child-led learning. Just cause daddy wants them to play in the NHL, start hockey when he’s two and push hard, doesn’t mean it’s going to happen. If the kid is motivated, there is little pushing required. When their natural interests are nourished, their abilities will soar. As a friend recently suggested, I wish I knew what they would be when they grew up, so I could tailor their education towards that. Indeed! But that doesn’t happen. One doesn’t bring home a baby bundle with a playbill of that child’s lifetime achievements. So we must explore their world with, and for, them. No doubt, learning fortitude, consistency, and skills will equip them to do whatever they’re going to do, so I maintain an ‘on the fence’ position. And still, I let them stop. 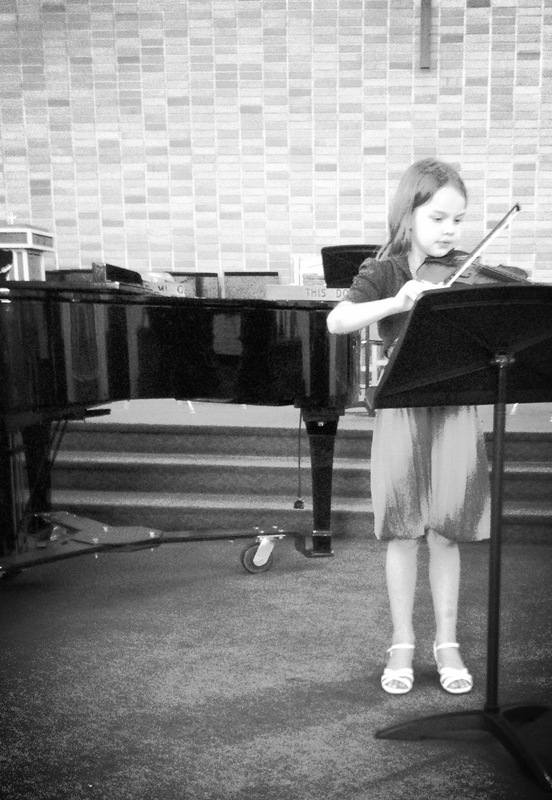 The day we returned the violin to Long and MacQuade, I sat somberly in the parking lot, near-tears in my eyes. Mom, are we gonna go in? Um, yup, I guess so. Do we have the shoulder rests, the smashed-to-pieces rosin? Is the violin case presentable enough to return? The Long & McQuade guy brought out the paperwork while the kids lost themselves in the store. When the deed was done, I didn’t hear the kids anymore. Wandering around the store, I followed a cacophony to the backroom. Hannah was strumming a ukulele, Madelyn and Rachel on guitars and Zach on banjo….It was music to this mom’s ears…but if you weren’t their mom, a cacophony: “a harsh, discordant mixture of sounds: or deafening alarm bells”…a good ole-fashioned Wiedrick hoe-down…. 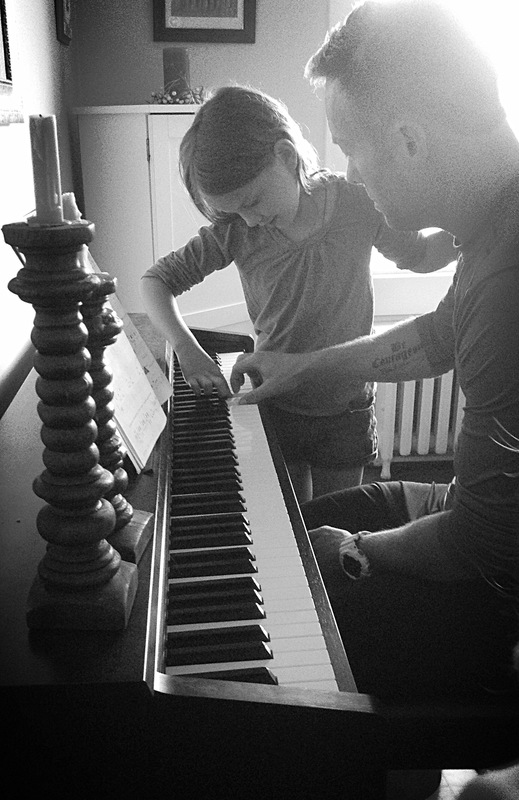 Tags: home education, music for kids, parenting, when to start musical training. Bookmark the permalink.